Humans have an innate urge to engage with their environments. Be it home, office or anywhere else, the surroundings affect and reflect moods, it becomes uplifting when the environment is vibrant and sinks when the world around is drab. Taking a cue from above, the productivity during work often stems from the worker’s mental state, that’s why an executive office chair’s aesthetics and ergonomics assume a great importance and not merely represent a style statement, but also a vital instrument for employee inspiration. Take a detailed look at the 15 best executive office chairs crafted to exude style with a sensible design and offer ultimate comfort. Find out what makes these chairs make it to the top 15 in this product category. 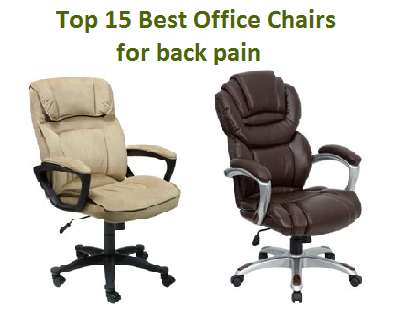 We have also written a complete guide about best high back office chairs. 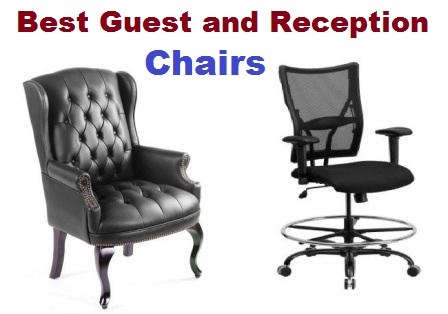 What Are The Noteworthy Advantages Of Executive Office Chairs? An executive office chair evokes strong physical and psychological attachment than other pieces of office furniture since the office workers spend a lot more time in it than they do at their home. Obviously, an executive chair has a lot more advantages than being just a tool for working. Employee efficiency and retention: High-end executive office chairs can alter a workplace’s environment morally. The form factor and function can lift employee morale, bolster teamwork, and sustain productivity. Executive seating can encourage the workers to spend more time in collaborative endeavors within the workspace. While it’s known that these days workers can choose to complete their tasks anywhere, even remotely, on the contrary, if the workers find their cubicles more refreshing, they put in best talents to perform their daily tasks. Consequently, employee satisfaction lets the talents stay in-house. Visual appeal: No matter how well-placed your company is, or how much profit it rolls in, executive seating actually adds to the aesthetic appeal of the workspace and that’s what people notice at the first sight. Interesting and attractive decor coupled with functional and modern executive office chairs can modify the look of even a simple workspace. Boring, dreary aesthetics can’t fill a space with vivacity. Moreover, exquisite form factor and a range of color choices in executive chairs allow for a better customization. Better potential returns: While countless people consider a workplace design as a squandering away of funds, savvy business owners understand the relevance of this investment. A pleasant office design and better-looking executive chairs affect everything that happens within the walls of the workspace, from the first impressions made on potential clients and the future of the business deals. In this manner, the investment put into executive chairs fetches lucrative future returns. Short- and long-term health benefits: An executive chair must have a strong headrest that supports the neck muscles and a firm backrest to maintain the proper posture and spine alignment. A proper blood circulation around the neck and shoulders prevent stiffness and stinging pain. Strong executive chairs can offer just the right lumbar support so that life-threatening and chronic illnesses can be avoided. Moreover, the executive chairs have adjustable seat height so that the feet is rested flat on the floor and the knees remain perpendicular to the same. A comfortable seat supports coccyx and buttocks. Executive chairs contain a flexible reclining function so that the user can have a proper rest in between the long sitting sessions. 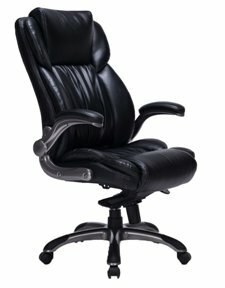 What Are The Important Features To Seek In Executive Office Chairs? Whether you need a small office redesign or a complete renovation of your company’s workspace, the vital features of your executive office chairs can have a tremendous impact on your employees’ and company’s well-being! Customizable and proper features in an executive chair can make your day. Read on to find out what features you should seek to make the most out of an office chair. Executive office chairs include a 5-star base with wheels. Such a base provides stability and free movement. Since users want the rolling executive chair to move and turn effortlessly without tipping over, they must look for bases measuring at least 27 inches in diameter. 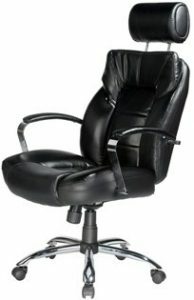 An executive chair with casters should be bought depending on the type of floor you have. Hard plastic and metal casters work fine on industrial carpet. Soft wheel casters work well for tiled and hardwood floors. An executive chair must be resilient enough to withstand 14 hours of constant daily use. Pneumatic gas lifts must be provided in a chair for seat height adjustment. This allows users to move the chair closer to the workstation and achieve a right angle to the computer monitor, lessening the strain on the eyes. The armrests must be adjustable that allows users to have a greater flexibility. Adjustable arms can take the tension off shoulders and neck while typing. Backrest height adjustment should allow the executive chair to slide up and down to facilitate the lumbar curve of the chair’s backrest to support the lower back. Back angle adjustment and reclining must support the upper body weight and relieve the lower back’s weight. 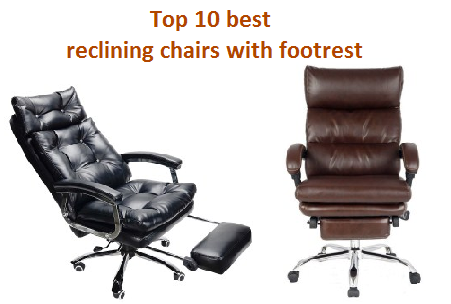 Executive chairs must have a locking back angle adjustment to find the ideal upright or reclined position and should allow the users to have that position locked. Nothing ruins a day quite like the moist feeling of the sweaty back. The material on an executive office chair’s seat and back should be cool, moisture-resistant, and must have enough padding to be seated comfortably for longer periods of time. Having a mesh cover that breathes is preferable to a non-breathable surface. A cooler fabric allows the sweat to evaporate. While being soft enough to offer comfort to the user, the padding in the chair’s cushioning mustn’t wear down over time. Moreover, the fabric and the materials must look appealing to the eyes. Lumbar support is perhaps the most vital aspect to understand and analyze. If a human spine ran straight up like a stick, then a classic dining chair would be sufficient for the workstation. However, the spine contains three curves, the lumbar vertebrae constitutes the spine’s lower section and the lumbar region curves inward. An executive chair must have sufficient lumbar support, or else users slouch over their desk and this causes muscle stiffness and chronic pain. The armrests mustn’t be too high or low in an executive chair, the user’s shoulders shouldn’t remain raised and he should be able to rest both arms simultaneously, this will reduce muscle tension in the neck and the shoulders. Armrests of an executive chair shouldn’t be close as it can restrict quick and easy movement. Armrests that are too spaced apart can cause muscle tension and fatigue. 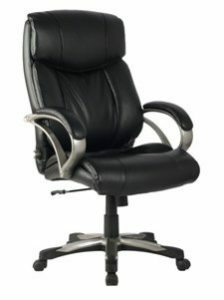 Moreover, a good executive chair should be supple and must cradle the entire body with comfort. Executive chair ergonomics (Check out our complete guide about best ergonomic office chairs)must contain a perfect 360-degree swivel. An apparently innocuous action like turning the body to reach for something while seated can result in a serious nerve injury. Repetitive sprains can result in severe soft tissue and nerve damage over time. To avoid having to constantly twist the lumbar spine, the user must find an executive chair that swivels 360 degrees. Find an innovative way to work with La-Z-Boy Bellamy Executive Office Chair! From a trustworthy brand known for its quality, time-honored craftsmanship and comfort, the La-Z-Boy Bellamy Executive Office Chair delivers sophisticated comfort technology for outstanding support both at workplace and home. La-Z-Boy Bellamy bonded leather executive office chair features a wider plywood sub core, rock-hard back bar and heavy-duty casters for resilience. Users can count on it for their daily activities. Crafted with wooden components, this chair creates a stylish blend of conventional style and contemporary performance ideal for any home, office, or entertainment space. The cable actuated levers enable convenient adjustment. The firmly-contoured waterfall seat edge adds to the form factor. The product dimensions are 31.2 x 27 x 44.5 inches and the item weight is 57.2 pounds. 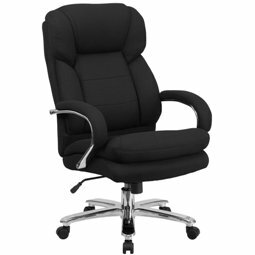 The executive chair supports up to 250 lbs. If you’re looking for a well-built chair, this is the right choice for you. The commercial quality strength constituents surpass meticulous BIFMA testing standards. The high-quality executive chair is made of soft and deluxe bonded leather that appears chunky but is soft to touch. The thick contoured cushions and premium wood finish of the base makes the chair look elegant. The workmanship is good, stitching is well done and is durable. The chair has trusted ComfortCore® Plus layers with memory foam. The classic-styled, elegantly finished, hand-sculpted wood arms add a rich look. The chair is available in coffee brown color. ComfortCore® Plus with memory foam is a sophisticated layering system that offers exclusive zone-based support, placing cushioning in the regions you require most. There’s a Polyfiber-fill comfortable top layer, a memory foam support layer and an extra layer for comfort. There is a soft support at the front and a firmer support at the back of cushion. The waterfall seat edge promotes better leg circulation. The strategically-assigned luxurious body pillowing and padded headrest combine to offer neck support and reduce pressure points for relief from uneasiness caused by prolonged sitting. This executive chair is entirely adjustable. You can manage the tilt, height, and lift for customized positioning and optimized body placement. The contoured lumbar area offers tailored lower back support and alleviates soreness. Obtain the aptly-named Flash Furniture HERCULES Series 24/7 Executive Chair! The contemporary 24/7 multi-shift use executive chair was engineered to meet around the clock needs. HERCULES Series 24-hour office chair can be used in a 9-5 setting but is more suitable for multiple-shift environments such as to satisfy the needs of employees in 911 dispatch offices, call centers, nurses’ stations, disc jockeys, control room engineers, and government personnel. The big and tall multi-shift design aids in accommodating taller and larger body types. The chair offers a broad seat and back width. The pneumatic adjustment lever allows users to simply adjust the seat to a desired height. The loop arms and headrest make the user stay seated for long periods. The tilt lock mechanism facilitates the reclining to a greater degree. Product dimensions are 31 x 28 x 50 inches and the item weight is 66.6 pounds. This chair has been tested to bear a maximum capacity of up to 500 lbs. It is a heavy-duty product which will last for years of continuous use. The genuine black leather is well-made and shows no signs of wear and tear even after a prolonged use. The heavy-duty metal base is crafted to satisfy the trials and tribulations of an intensive use chair. It’s a very strong yet spongy chair made with sturdy materials. The heavily padded cushioned seats are soft to sit on constantly and do not tear or wither easily. The tilt lock mechanism of this executive chair offers a relaxed rocking/reclining motion. The unrestricted range of motion allows the users to take a swift break from glaring at the screen or reading to a relaxed posture. 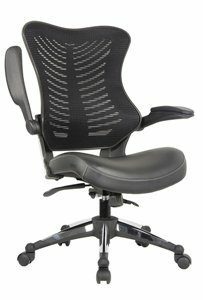 The high back extends to the user’s upper back for superior built-in lumbar support. The double-padded, contoured seat reduces pressure points for superior comfort. Chair swivels easily 360 degrees to get the maximum utilization of your workspace without any strain. Adorn your workspace with Viva high back executive leather chair! Viva Office presents a comfy high-back full-size executive leather chair with an immense lumbar support for your prolonged day-to-day sitting sessions. The doubly-padded comfortable seat and pneumatic levers offer the support when it’s needed most. Viva high-back executive chair has modifiable built-in lumbar support and thick padded seat cushion, backrest, and headrest. Simple pneumatic controls facilitate users to elevate or lower the seat, to recline or be seated upright all day. The flexible lumbar knob allows the pressure regulation. A tilt tension knob underneath the seat adjusts the chair’s rocking ability. The chair has waterfall seat edge. Pulling the control handle allows the chair to lean back or forward and a push averts it from leaning. Seat elevation of the chair and its lowering to the desired level is achieved by pulling up the same control handle. The product dimensions are 34 x 27 x 16 inches, the assembled height, length, width, are 44.9″, 27.2″ and 27.6″ inches respectively. The chair weighs 58.4 pounds. The resilient chair has a load capacity of 250 pounds. Viva Office executive chair has premium bonded black leather which has no toxic smell. The chair is PVC upholstered that makes it extra soft and supple. The thickly-padded seat cushion and also the contoured back cushion is encased with lush leather and PVC. Durable nylon base and dual wheel casters add to the chair’s appearance. The executive chair offers perfectly modifiable lumbar support and vital comfort to users with health issues. The flexible seat cushion and soft headrest help soothe the nerves and muscles. The waterfall seat edge reduces exhaustion and strain on your legs and boosts circulation. The executive chair encourages an ergonomically accurate posture that’s essential for corporate employees. The controlled as well as pressurized lumbar support knob normalizes the weight on spine and back and puts forward better support. Experience ultimate lumbar support with heavy-duty Essentials by OFM Big & Tall Executive Chair! If you’re looking for an executive chair that’s quite sturdy and gorgeous, with the perfect firmness and seat angle, go for Essentials by OFM Big & Tall Executive Chair. This is a product that doesn’t crush under a heavy body mass and remains in top shape even after many years of use. 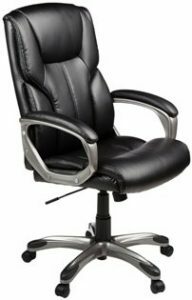 The ergonomic design features on this executive leather office chair include an adjustable tilt lock, a pneumatic gas lift seat, and an adjustable height. It stands on a well-built 5-star metal base and has strong casters for easy mobility. It has padded arms, tilt lock modification, and rotates 360 degrees. The item weight is 29.2 pounds and the dimensions are 29.9x 31.7x 49inches in width, depth, and height. The optimum load capacity is 400 pounds. Essentials by OFM big & tall executive chair cradles the body with plush black bonded leather for an expensive look and lush comfort users could sink into. The standard black leather and a silver mist-finished frame make this chair ideal for executive offices. Seat and back is made of leather, the black finished body with silver accent renders a luxurious look. The metal base has a silver mist finish as well for long-lasting use. 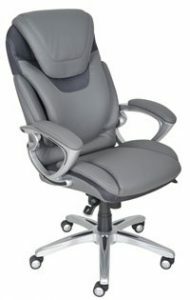 Segmented padded seat and back with ultra-plush cushioning give this office chair an unparalleled support and comfort. The comfy work chair includes a complete swivel, seat and back tilt, and a pneumatic lift seat height adjustment. This executive chair has padded arms for upper body comfort and a modifiable locking reclining ability. If your desk is quite high, and if the chairs do not sit tall enough to make it comfortable, this is the top choice for an ultimate back support. The padding on the armrests is soft and wide and comes at 3 inches at the widest and helps soothe the muscles and joints. Maintain a good posture with Serta Big & Tall Executive Chair! Hand-sculpted upholstered metallic arms and soft bonded leather combine modern style with deluxe comfort, making this Serta executive chair the perfect complement to your office décor. This chair is like a giant plush pillow. 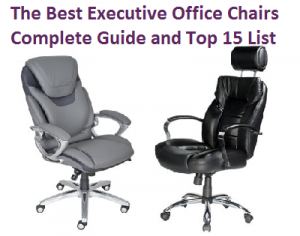 If you’re looking for a new executive chair, look no further! Upholding the Serta legacy of comfort, class, and style, the Serta big & tall executive office chair integrates one-of-a-kind technology. Ergonomic regulations and elevated headrest permit customized positioning to support your body and perk up posture. Generous seating area and commercial-grade elements bear up to 400 lbs and offer uncompromising durability. It can recline comfortably. It has a taut tension adjustment knob which allows putting some tension into reclining and lets you set fixed positions. The chair meets BIFMA testing standards. The item weight is 48.7 pounds and the product dimensions are 30.2 x 28 x 47.8 inches. Made with industrial-grade constituents such as an extra-large steel plate and thick plywood, this heavy- duty executive chair is built to last. The Premium Elite Smart Layers structure features 5 layers of specialized foam placed strategically over individually pocketed ComfortCoils to provide adaptive ease and optimal support. The layers include Poly-fiber top layer, full-seat memory foam layer, macro-dense softness layer, micro-dense support layer, ComfortCoils, and total-edge containing layer. The deep, layered body pillows finished off in a soft bonded leather provides a plush feel and ultra-soft seating experience in any workday. The chair is approved by American Chiropractic Association. The elevated headrest alleviates strain allowing users to customize their position and improve sitting posture. This chair’s roomy and cushy seating area increases productivity without feeling constricted. Waterfall seat edge supports better leg circulation. Ergonomic and cable actuated seat-side levers allow convenient adjustments. Users with spine issues can recline in this high-back chair. The arms are correctly cushioned. It doesn’t make bizarre sounds when you twist, scoot around, or recline. Find a blend of style and support with Comfort Products Commodore II Executive Chair! With an emphasis on corporate seating and office decor, Comfort Products Commodore II Black Executive Chair mingles a luxurious look with plush comfort to enhance the lives of consumers working longer hours. 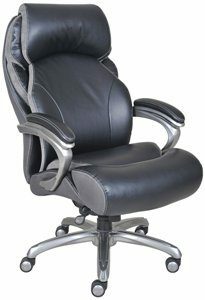 Commodore II executive chair by Comfort Products has a broad frame that supports over 350 lbs. The chair features a modifiable headrest to tailor head support, padded chrome arms, seat height adjustment and reclining. The metal chromed base with dual wheel casters are 33% thicker than regular executive chairs and they include extra-strong 4-point welds. The arm underneath the cushion attached to a nylon base allows users to regulate the settings for the Commodore II chair’s tension, tilt, swivel, lock, and height of heavy-duty Class 4 metal pneumatic lift. The seat is wide and thick measuring 23.5″ and 5″ respectively. The item weight is 54 pounds and the product dimensions are 29.1 x 15 x 26.4 inches. Designed to bring style to any office, Commodore II executive chair’s black bonded leather upholstery and padded chrome armrests provide a rich look. The attractive modern cushion design attaches to long-lasting chrome base and L-shape metal brace. Richly padded cushions including the seat, back, and armrests are covered in a supremely comfy bonded leather to match any decor. 100% pure resin casters are 30% stronger than regular casters. The seat cushion, back, and armrests with chunky and rich padding allows for added back support. The tilt, lock, tension, swivel, and gas lift height adjustment enables better ergonomics and alleviates strain on nerves. The high-backed Commodore II executive chair features an attractive cushion and headrest in soft leather to soothe muscles, with waterfall-style molded, padded armrests linked to a tough black nylon base. The headrest and tall back offer a solid support when you recline. The padded armrests are easy on elbows and help alleviate shoulder tension. The seat is extra wide and arms are further apart. For an “oversized” user, the critical spot of failure is the body pressing outward on the arms and finally over-stressing the bolts which hold the chair on. With a much wider seat, you barely touch the arms of the chair with your body. Add to your office aesthetics with Viva Bonded Leather Executive Chair! 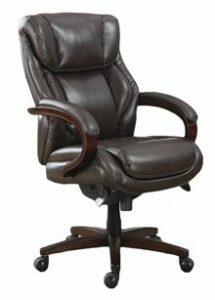 Deluxe high-back bonded leather ergonomic managerial and executive office chair with double padded headrest, contoured seat, and backrest cushion offers the necessary comfort. Simple pneumatic controls and tilt-tension knob underneath the chair seat of the executive chair allows to elevate or lower the seat and rock back or stay seated straight for hours. Front to back dimension is about 20″ and width is about 24″. The weight capacity is 250 lbs but can support bigger body mass of about 300 lbs. 2 adjustment handles are utilized to elevate or lower the chair, and lock the tilting mechanism at any point while reclining. If you desire to sit at half-lean, you can! You don’t have to recline all the way back. The arms can be moved up-and-out of your way like airplane seats. The Item Weight is 59 pounds and the Product Dimensions are 32.5 x 27.5 x 16.3 inches. At lowest position, the chair’s top of the seat is 21 inches from floor. It fits under any desk just fine. When at highest point, the top of the seat is 23 inches from the floor. Bonded black leather and PVC upholstery make a smooth and supple finish all over the chair, equally enveloping the padded seat cushion along with the contoured-for-support cushion at the back. Flip-up arms are encased in bonded leather as well, first-rate plush armrests, nylon base and casters allow great flexibility and render a premium look. The flip-up arms create amazing flexibility and allow relaxing and unrestricted movement from time to time. The amazing tilt tension control and adjustment of back angle with tilt-lock facilitate movement or firmness as needed. The seat has waterfall design so your legs are relaxed and there’s no restlessness for hours. Great lumbar support and added comfort is obtained from the chair. The adjustable office chair promotes an ergonomically correct posture necessary at your cubicle for long stretches of time. The chair offers black padding on the softly curved armrests for improved support. Find utmost stability with Boss Office Products heavy-duty big & tall chair! Designed for big and tall users, Boss B991 durable executive chair provides sleek style and support for all-day ease. The chair’s commercial-grade elements support greater load, while its extra-resilient design bears constant use. When standard-size office chairs don’t fit the bill, pick the Boss Office B991 bonded leather big & tall executive chair. A 6″ modifiable height range is designed and supported in this chair with a hardwearing pneumatic gas lift just to lower the seat, just stay seated and pull up on the simple-to-reach pneumatic control handle until you’re at a desired height. Release the same handle and the seat locks to your fit. To raise the seat simply remove your body mass from the seat, then raise the lever and release at a desired height. The chair has heavy-duty spring tilt mechanism, 27″ brushed metal 5-star base and 3″ double wheel casters. This is a big man’s chair; and its weight capacity is 350lbs. The item weight is 54 pounds, the product dimensions are 31 x 33.5 x 45.5 inches and assembled height and width are 45.5 inches and 33.5 inches. The chair is upholstered in black, smooth, and supple bonded leather, Boss LeatherPlus, which encases both the contoured-for-support back cushion and its padded seat cushion. 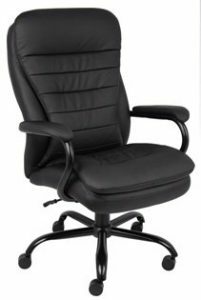 For added wrist, forearm, and hand support, the Boss B991 executive chair provides black curved armrests, softly padded with matching LeatherPlus upholstery. The chair’s available in classic black, bomber brown, and now gray. 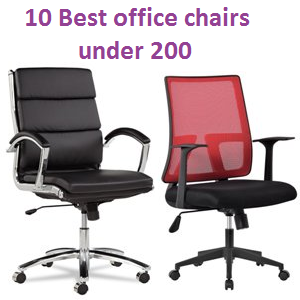 Regular office chairs have a typical 25″ base and casters, Boss slightly raises the bar. 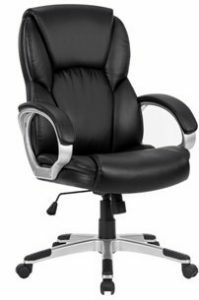 Boss B991 is an executive chair with the stability of a 27″ 5-Star base with 3″ dual wheel casters. When you want to recline, spin 360 degrees for multi-tasking or shift across areas of your office, you do it without tipping or tripping. The executive chair has adjustable settings and curved contours to keep the spine supported and the body properly aligned. The chair’s built-in lumbar support provides additional support for the lower back, while the ergonomic tilt mechanism with vast locking adjustment facilitates setting the chair to a preferred angle. The deep layers of thick plush seat padding ensure better-quality and consistent sitting comfort. Get your job done with LANGRIA Ergonomic High-Back Leather Executive Chair! LANGRIA high-back executive office chair has a professional and elegant look and provides day-long comfort without feeling any soreness. Get yourself seated on this executive chair and take pleasure in your working day with an ergonomic design! 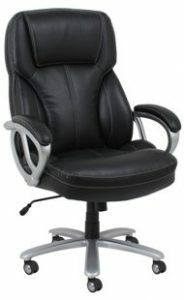 The executive chair has synchronous-tilt with 1 position lock. You can press on the lever to lock it in a vertical position at 90°; pull the same lever out to release and tilt the chair back between 90° and 105° to support the body’s natural movements. A pneumatic gas lift system enables seat height adjustment by flipping up the lever beneath the seat, and the tilt tension control knob is rotated to balance different size/weight users. 360° swivel allows making the utmost use of a workspace. This chair is durable and sturdy enough to support up to 264 lbs of uniformly distributed body weight; the tilt mechanism satisfies the BIFMA standards while its heavy-duty nylon legs and casters boost safety and firmness. Overall upright dimensions are 26.6 inches, 28.5 inches, 41.1-44.3 inches in width, depth, and height. The item weight is 31.3 pounds and the product dimensions are 26.6 x 28.5 x 41.1 inches. LANGRIA black ergonomic office chair is upholstered in plush faux leather with soft and well-padded seat, backrest, and armrests. Coated nylon casters equipped with anti-skid pads are crafted for the comfort of your feet while seated, and also adds to the ease of scooting around. It’s available in 3 sizes, Black, Black 1, and Black 2. This convenient executive chair with a 360-degree swivel offers an all-around range of motion, and the 4 soft casters enable you to roll around for multi-tasking convenience. Considerate design supports your body. Double padded backrest and seat cradle the body softly offering a complete spine support. Well-padded armrests are crafted to relieve the exhaustion in your shoulders and arms during typing and evaluating files. Find a balance of wellness and design with Serta Leather Executive Chair! Maintaining the Serta legacy of comfort, class, and style, the Serta Wellness by Design Executive Chair with Air Technology keeps you sitting comfortably during the day so that you find comfort and style everywhere, at home or in the office. The chair features an ergonomic adjustment control that enables easy arm positioning for supportive placement of entire hand. Ergonomic seat-side levers and gas lift enable easy height and tilt adjustment. The 38.9-pound chair features the Air kinetic lumbar pivots that adjust to your movements for continuous lumbar support. Fortified base layer prolongs stability and durability and resilient 60 mm casters offer soft mobility. The mid-back style has Arm height adjustment of 25.50-29.25″, inner seat dimensions of 19.5″x 19.5″ x 25.75″ inch in depth, height, and width. The height range is 42.75-46.50″. Designed to harmonize with your professional décor, Serta executive chair has hand-sculpted upholstered arms and is finished in a supple and smooth eco-friendly bonded leather for current style. The modern 2-toned upholstery and metallic finish complete its chic look. Deep, ergo-layered cushioned body pillows offer you a serene and calm sitting experience. Soft upholstered arm pads on chic sculpted arms with black accent adds a glamorous look. The available color is light grey. Flexible AIR lumbar pivots with movement correct posture, relieve pressure points, and offer dynamic back support. Deep-layered body pillows bring cushioned comfort that lessens pressure and customizes lumbar support. Ergonomic seat-side controls enable quick and customized height and tilt adjustment, you adjust the chair’s positioning as desired. Pneumatic lift with adjustable tension and lock ensures right foot positioning, arm adjustment control guarantees supportive wrist, hand, and forearm placement for optimized comfort and total body support. Air Technology is infused in this chair for spinal health and wellness. Reactive AIR lumbar zone bends and twists with body movements, constantly aligning the body in a neutral spine position. This eliminates strain and prevents injury due to prolonged sitting. Obtain couch-like comfort with La-Z-Boy Fairmont Big & Tall Executive Chair! La-Z-Boy Fairmont Office Chair is an example of class, time-honored design, and robustness. The ComfortCore Traditions Chair incorporates a liberal design with sophisticated performance for excellent support and relaxation in a corporate setting. This executive chair has a thick plywood sub-core, rock-hard back bar and well-built castors for durability for all your cumbersome activities. Generous and spacious seating area and industrial-grade big & tall components can bear 400lbs for rigid comfort, firmness, and durability. Item weight is 61.2 pounds and product dimensions are 33 x 27.8 x 46.2 inches. ComfortCore Plus with memory foam is a developed layering system providing ample cushioning and optimum firmness for support and comfort. The layers are, top layer of Polyfiber-fill comfort, memory foam support layer, extra layer for general comfort, soft support at the cushion’s front and compact support at cushion’s back. Biscuit brown bonded leather upholstery and wood arms and base in walnut saddle (brown) finish add a touch of elegance. Crafted with premium wood components, this high-back office chair is soft and supple to sit on and comprises a stylish blend of traditional style and contemporary performance that is perfect for any home, office, or entertainment space. ComfortCore Plus with Memory Foam is a layering system presenting exceptional zone-based support with adaptive cushioning in painful areas. The strategically-allocated lush body pillowing and padded headrest on this office chair offers neck support and assuages pressure points. This ergonomic chair is entirely adjustable for a modified fit. You can manage the height and tilt to go with your necessities for bespoke positioning and optimized posture. The contoured lumbar area offers personalized lower back support to assuage discomfort. 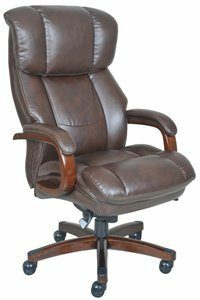 Embrace softness and lumbar support with XtremepowerUS PU leather chair! 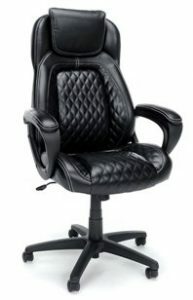 XtremepowerUS High-Back PU leather chair is suggested for constant daily use. It’s pleather-encased seat and back offer users comfort and relaxation all through their workday worries. The big & tall high-back PU leather chair has large and oversized plush cushioning. The seat height is adjustable with one touch and multiple adjustments help manage the seat’s position. Assembly is needed for this chair. Product dimensions are 24″ x 29″ x 13″, the dimensions of seat are 21″x 20″ in width and depth, whereas the back measurements are 21″x 25-1/2″ in width and height. The item weight is 38 pounds and the maximum weight capacity is 350 lbs. PU Leather, PVC, and steel make up the XtremepowerUS chair. The padded chrome arms and plush pleather encasing render a balanced look to the chair. The chair is available in 2 colors, black and brown. The lumbar support of the XtremepowerUS chair is just ideal, and the high back is at just the right angle so you feel like your back is staying in alignment. Waterfall seat cushion edge slopes downward softly to help lessen the stress on your legs and the back of your knees. Padded chrome arms go easy on the forearms, wrists, and elbows. Hefty and oversized cushioning is luxurious and comfy to sit on for longer hours. The chair satisfies and/or surpasses the stern ANSI/BIFMA performance standards. Embrace the goodness of resilience and comfort with Essentials by OFM Racing Style Executive Chair! Essentials by OFM executive chair is where class meets comfort. The Essentials ESS-6060 executive office chair takes your workday experience to a whole new level. Crafted in an ergonomic race car style, the chair offers high performance and advanced comfort for the intense work sessions. The style, comfort, and ergonomic design of the ESS-6060 make it a wonderful addition to your house or office. The chair meets or surpasses industry standards for safety and toughness. The chair offers ergonomic posture support with its fully adjustable seat height and back tilt to match your comfort and sitting styles. With the seat adjusted moderately high, the arms of chair fit under a desk quite comfortably. The comfort level is excellent and the look and structure of the chair are of a grand quality. For tall users, the executive chair easily reaches up to the middle of the head. The heavy-duty and durable chair has a 250 lb weight capacity for long-term use. Item weight is 49 pounds and the product dimensions are 31 x 26 x 15 inches. It has segmented and contoured ultra-soft padding, high-back, and an incorporated headrest and lumbar support. The thickly padded armrests offer extra upper body support and the executive chair also includes tilt-lock/tilt-tension control with a 360-degree swivel. The race car style chair is available in black color and is upholstered in soft and supple SofThread Leather with contrasting stitching for a luxurious look and feel. SofThread leather upholstery and a two-tone sewn look emphasize the diamond design on the back and seat center highlighting the quality and luxury details. Ergonomic and adjustable swivel chair makes you pace through your work day in a lavish leather encasing with high back, ultra-plush padding, integrated headrest, and better lower back support. This executive chair offers comfortable style and quality support for your upper body with contoured and segmented padding, and snug padded arms. 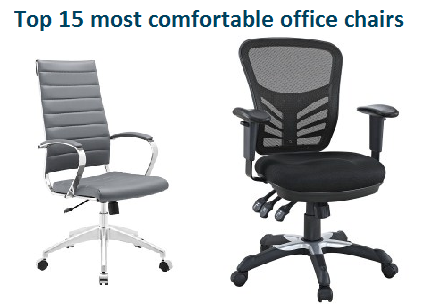 Boost your productivity and comfort with Office Factor Executive Chair! Designed with intelligence and while keeping the corporate setting in mind, the Office Factor Executive Chair leverages flexible and powerful materials that intuitively react to body movements to offer over-arching comfort all through the day. The executive chair has adjustable height and the arms are not attached to the back. The chair offers good lumbar support and superior reclining with its spring tilt mechanism with regulating tension control and tilt lock. The item weight is 38.1 pounds and the product dimensions are 29.5 x 26 x 43 inches. The chair is nicely cushioned for occasional leaning back. The height of the high back chair is 25 inches from the seat. The chair’s back comes up to the middle of users’ head. This chair is suitable for office and is easy to put together and lasts longer even if it’s used 24/7. The arms fit well beneath the desk so you can slide up quite close to the computer. The ergonomic high-back office chair has padded armrests for a soft and plush feeling that keeps the hands soothed. The black bonded leather upholstery creates a stunning look for any office decor. The chair has a big base and double casters for better stability and swifter movement. The chair is available in 2 colors, black and brown. The ergonomic black bonded leather chair has an outstanding lumbar support with adjustable armrests. The chair swivels better in 360 degrees for an easy flexibility and unrestricted spinning. The high back office chair enables the users to perform their work in a better way without putting any strain on spine, neck, and the shoulders and also enable them to take a break every now and then. The chair features tilt lock, tilt back, modifiable tension. 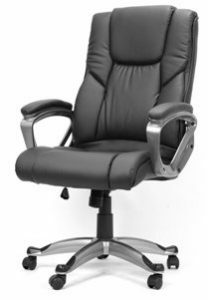 Find a perfect comfort-toughness balance in AmazonBasics Executive Chair! AmazonBasics High-Back Executive Chair gets you through the day. Whether you’re busy in boardroom or signing new business deals, the executive chair provides professional style and idyllic lumbar support all day. The chair features pneumatic seat-height adjustment and 360-degree swivel with smooth-rolling casters. To raise the seat, users must remove the body weight on the chair and pull up the pneumatic control handle. To lower the seat, simply stay seated and pull up the pneumatic handle to reach a preferred height. The executive chair can be 41.34-45.08 inches high. The pneumatic handle controls the tilt and rocking action. The chair measures 29.13″x 25.59″x 41.34-45.08″ in length, width, and height; assembly instructions are included. The maximum weight capacity is 250 pounds and item weight is 35.3 pounds. The assembled height and width is 45.08 inches and 27.56 inches respectively. Bonded black leather and PVC craft the smooth and velvety upholstery of the chair, mutually enveloping the padded seat cushion along with the contoured-for-comfort back cushion. The chair has metal-finished base and arms. The chair offers black padding on the softly curved armrests for improved comfort and support. The chair’s available in 2 colors, black and brown. A tilt-tension knob below the seat enables easy reclining, depending how you rotate the knob. The 360-degree swivel & nylon casters keep the chair secure and strong for long haul. Offering a flexible array of motion, the executive chair offers multi-tasking convenience, and its durable casters make rolling easy. The seat provides support to thighs and coccyx. The chair’s fully adjustable and ideal for adapted comfort, it features a butterfly seat plate, variable settings, and curved contours to keep the back supported and body correctly aligned while sitting for prolonged periods.